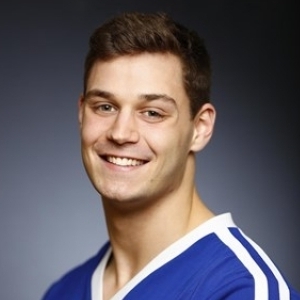 Current UK MBA student athlete at the Gatton College of Business and Economics, Christopher Miele, helped lead the University of Kentucky cheerleading team to their fourth consecutive national championship and 24th overall at the recent 2019 Universal Cheerleaders Association College Nationals in Orlando, Florida. The three-day event, which also included national dance team competitions and events pitting the best mascots, stunt teams and smaller division schools against each other, culminated in the crowning of the Cats in the UCA’s Division IA co-ed ranks. "It feels great to be a national champion," says Chris. "In these competitions, you have essentially 2.5 minutes to be perfect. We all put in many hours of hard work, inside and outside of the classroom, and it certainly paid off." Balancing the commitments of a student athlete, like Chris, can be very challenging especially coupled with a rigorous program like an MBA. Chris is currently balancing 51 credits of courses over an 11-month period, while putting in the time at a high level every day on the Kentucky Cheer team. Chris says, "It's all about time management. Many may think that we don't take our academics seriously because we are more focused on being an athlete versus a student, however this couldn't be further from the truth. Everyone on the team has high aspirations for themselves academically and wants to be successful in their professional careers down the road." After completing his degree in Mechanical Engineering degree at the University of Kentucky's College of Engineering, Chris joined the One Year MBA program at Gatton through the Engineering/MBA Dual Degree program. This dual degree was established to give UK students with technical backgrounds in engineering and computer science the leadership, critical thinking, communication, problem solving and team-building skills while increasing their knowledge in economics, finance, marketing and management. The goal is to equip more engineering students with the technical, analytical and business skills to lead strategic initiatives in high-tech, operations and manufacturing companies. Regarding his motivations for pursuing an MBA, Chris says, "I wanted to challenge myself and expand my skills further. I felt that my degree in Mechanical Engineering, coupled with an MBA, would give me a competitive advantage in becoming a future leader. I hope to become a managerial engineer in either the manufacturing, defense or supply chain industries after I graduate this year. My long-term plan would be to ultimately become an entrepreneur and own a successful business." Gaining additional professional experience while in the UK MBA was important to Chris and he took advantage of the built-in internship experience unique to the One Year MBA program called Project Connect. Chris was put on the R.J. Corman Railroad Group team with other MBA students at Gatton. For 32 weeks, student teams are paired with companies to work on projects of importance to their corporation or organization and happens simultaneously with the student's coursework. "Working successfully in teams and identifying what people's skills are, and how they can contribute, is something that translates well from cheerleading," says Chris. "To be a successful student athlete, I've had to rely heavily on my MBA classmates and very similar to how I rely on my cheerleading teammates. In the end, we all must work together to accomplish the overall goal." Chris has won a total of four national cheerleading championships while being a student at the University of Kentucky. Chris also represented the USA at the 2018 Winter Olympics as their first Olympic cheerleading team. Chris has also volunteered his time in the community, including UK alumni functions, UK Hospital Breakfast with Santa and the University Health Services (Tobacco Free Campus Tailgate).